The Netherlands-- When a tragedy hits us, "somehow we have to take it and render it somehow speakable, in other words, we try to find a linguistic shorthand to make the process easier to bear." For example someone "passes away," or they "cross cover," or simply "cease to be." Ironically, this was a partial quote from an article I was reading while in Spain this past weekend, when I heard of the death of our friend and colleague, Minck Oosterveer, who died Saturday night, Sept. 17th, in a motorcycle accident, in The Netherlands. But Minck, by the shear volume of wonderful artwork he has given to our industry, and even more importantly his actions as a human being, ensure he is someone who will never "cease to be." Minck was an amazing, award-winning, and talented creator who had a great impact on European Comics, and within the first part of this year was making a dynamic foray into American comics as well with work on "Ruse," and Spider-Man, and on "Zombie Tales," and "The Unknown" before that. I had known Minck for several years as a friend long before this. We began to work together later. I am very honored and happy to have had him as a part of Eva Ink Artist Group this eventful year. Throughout his career, Minck pursued an education to become a master of the arts. Although he grew up in The Netherlands (Holland) with European comics, he was soon more interested in American comics, especially the newspaper comics of the 1930s-50s. It was the pulp-ish, direct style and the usage of black and white in realistic artwork that attracted him the most. Film Noir as it were. In fact, Oosterveer's work was strongly influenced by Milton Caniff, Alex Raymond, and Will Eisner. After working for a studio on productions like 'Tom & Jerry', 'Sesame Street', 'Paddington', 'Ovide' and 'Spider-Man', Minck Oosterveer moved more in the direction of another stylistic forte, working with Willem Ritstier on the series "Claudia Brücken" for the Franco-Belgian publishing-house 'les editons Lombard' and Tintin-Magazine . In 2002, Oosterveer and Ritstier started a new daily comic strip in De Telegraaf, called "Nicky Saxx", one of their most successful comic-series. This was followed by a comic-series entitled "Trunk" (2006), which debuted to critical acclaim. Next they teamed up (2007) as writer (Ritstier) and penciller (Oosterveer) for "Storm", a successful European comic series created by Englishman Don Lawrence, and started a new western-comic, called "Ronson inc." for the legendary Dutch comic-magazine "Eppo"
Minck Oosterveer debuted in US-comics with the aforementioned "Zombie Tales/ Zaambi" written by Cris Morgan and published by BOOM!-studios. Early 2009 until 2010 he collaborated with American writer Mark Waid to draw the mini-series "The Unknown" and "The Unknown: The Devil made flesh" which where published by BOOM!-studios as well. In addition to "Ruse" and "Spider-Man" this year, Minck was also in negotiations to do sequential work for Dynamite Entertainment. 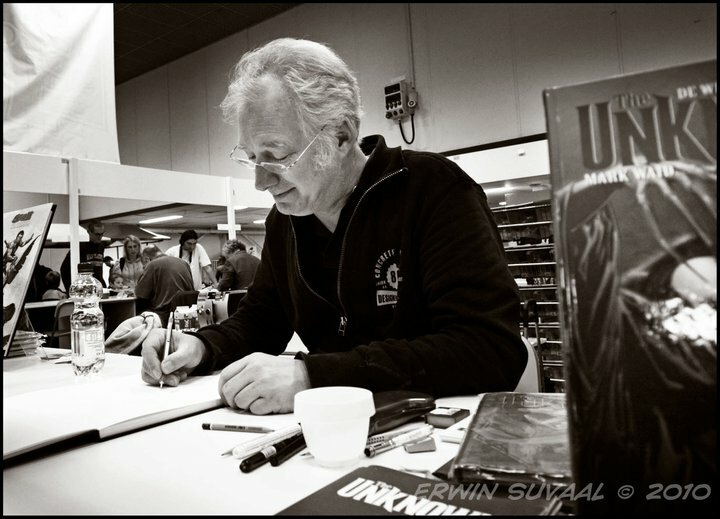 Earlier this year, Minck was honored with The "Stripschapprijs (Stripschap-award), which is the oldest and most important comic -award in the Netherlands. The "Stripschapprijs" is awarded every year to Dutch (with a few exceptions) comic creators for their whole body of work. And is awarded by the Stripschap, the Dutch Society of comics fans during the "stripdagen" (days of comics), the oldest comic convention held in the Netherlands, organized by "Het stripschap". His recent US tour found him making appearances in Philadelphia, Albuquerque, and at a special night in his honor at the Museum of Comic and Cartoon Art in Manhattan, moderated by Jim Salicrup. Okay...All of this documents his work. It does not document the man. Minck was without a doubt one of the wittiest, and nicest people I've met in comics or anywhere. I don't believe it would even be possible to find anyone that would have anything negative to say about the man. You could only know Minck a minute and he'd have you feeling at ease. Like you'd been friends forever. That was my experience. 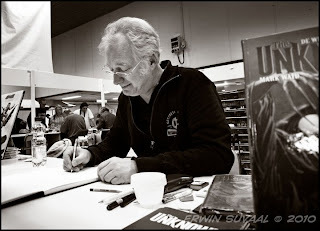 I met Minck for the first time over drinks with he, Barry Kitson and Mark Thelosen at the Lille Comics Festival several years ago, and it was one of the most memorable (and fun) conversations I can recall at any show any where. Lines from the night became our running jokes, in fact. Later, we met again during a store signing in The Netherlands,at my dear friend Guido's shop, and it wasn't long before we discussed Minck becoming part of Eva Ink Artist Group. I'm so happy he did. "From the moment Michael Golden and myself met Minck Oosterveer at a festival in Lille, France, we were struck by his witty sense of humor and his ease as a gentleman. After seeing his portfolio some time later, I also became aware of what an incredibly talented and versatile artist he truly is," commented Renee Witterstaetter of Eva Ink Artist Group. "Minck has that rare ability to find strengths in many art styles-- from Film Noir to cartoon, to American and European sequential styles. The one thing that is never lacking is good storytelling. Is is obvious to me that he is indeed a student of the masters such as Will Eisner and Alex Raymond in that regard. As with any exceptionally good artist, even his covers tell a story. To top that, not only is Minck a consummate professional dealing with deadlines and clients, but he is also the creator of his own intellectual properties. "All of the above made Minck a more than welcome addition to our company, Eva Ink Artist Group," Renee concluded. "I try to only work with the best, and to me, Mr. Oosterveer is certainly that." Indeed….I am honored to have known Minck for the time that I did, and all of us at Eva Ink Artist Group (Michael Golden, Mark Texeira, Steve Scott, and our friends Joe Jusko and Rodney Ramos among others) who got to travel with him this past year, certainly agree. His family alone knows the full depth of this tragedy, and our thoughts are with them. What words are adequate to express all of that? Please go to his Deviant Art page (or www.minckoosterveer.com) and see some of the work he has left for us all. It says more than I can. That was eloquent and elegant, Renee. I am truly sorry for your loss. He indeed sounded like an all around swell fella...and the few correspondences I had with him on Facebook bear that out...he was very personable and friendly with fans, a hallmark of a true pro.